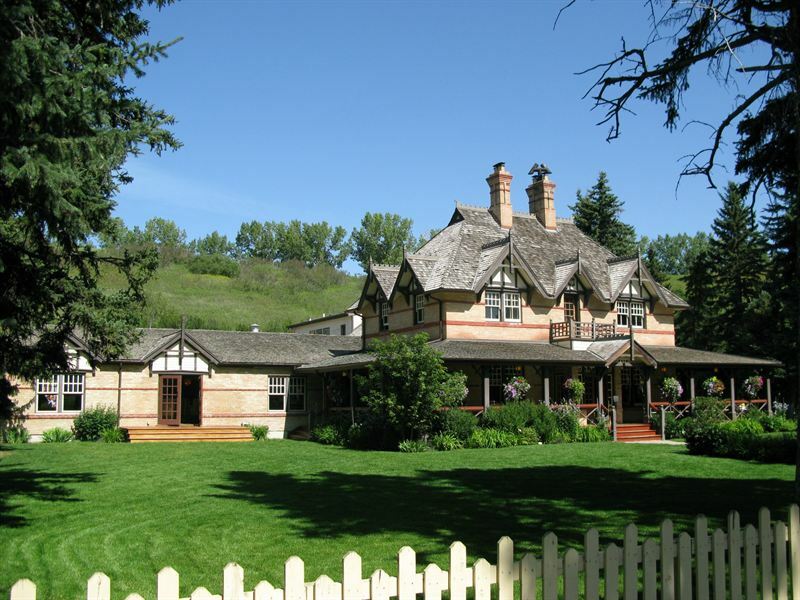 The Bow Valley Ranch House and property serve as an excellent reminder of the wealth generated by Calgary’s leading pioneer ranchers. The villa-like brick house was erected in 1896 by William Roper Hull, one of Calgary’s most prominent citizens. It replaced an earlier log structure which has been built in the 1870s by homesteader John Glenn and which was the first permanent farm in the Bow Valley area. In 1902, Patrick Burns purchased the 4,000-acre ranch, by 1937 other family members operated the ranch and did so until the early 1970s. The house and 1,400 acres of the ranch now form part of the Fish Creek Provincial Park. The house is a very good example of Queen Anne style. The symmetry of the facade around the central entranceway creates a strong sense of formality. The highly-articulated hipped roof, with half timbering in its many gables, helps to relieve any bulkiness of the massing. The protruding verandah on the main facade has been enclosed to create two sunrooms. Bay windows protrude on the east and west sides. Architects Rule, Wynn and Rule took great pains to match a 1957 addition with the main building. The interior of the 1896 structure features 11-foot ceilings and original plank floors. The ranch house exhibits very good detail and stylistic features, and is notable for the early use of brick. The Foreman’s House was restored and rehabilitated as “Annie’s Cafe” in 1998. The main house was restored and rehabilitated to accommodate a restaurant in 1998-99, including an addition with a kitchen and office. The site was originally settled in 1873 by John Glenn, a trapper and former gold prospector. Glenn was the first settler in the Calgary area. He built a log house and barns and lived here until 1879. The property was subsequently purchased by the government as an instructional farm for aboriginal peoples. In 1892, William Roper Hull, a successful rancher and businessman, purchased the property. When the original log ranch house burned down, he built the brick, two-storey house, now known as Bow Valley Ranch, at a cost of 12,000 dollars. The structure was finely detailed, with elegant furnishings chosen by Mrs. Hull. In 1902, Patrick Burns, a leading Calgary rancher and meat packer, purchased the property, complete with Mrs. Hull’s furnishings. Few modifications were made to the house. Pat Burns was one of the major forces behind the growth of ranching in Alberta. This was an active ranch until 1973. My Calgary is proud to showcase hyper-local community content from residents, organisations and community leaders to inform, entertain, and contextualise the Calgary experience.